Kaptensgatan 3 belongs Vaxholm oldest buildings. Parts of the house are from the 1600s and 1700s. Nicely renovated with two-three bedrooms with up to 6 beds. The house is situated above the city center with only 30 meters to the nearest bakery and greengrocer at the square. The upper floor offers a nice kitchen with dining area for five people, bathroom with shower and tub and a fireplace, living room with fireplace, library and sofa and armchairs, dining area with seating for 10 people and a spacious lounge with TV, piano and sofa / bed. Downstairs are two bedrooms and a large bathroom with two showers, toilet and washing machine. The villa on Kaptensgatan has a large plot with plenty of space for play. The view extends to the water in one direction and over Vaxholms purlins with Hall Square clock tower in the other. It is south facing with nice patio adjacent to the kitchen with an awning that protects from the sun on hot days. In Vaxholm are plenty of activities in a few minutes distance. Bath, cafes, restaurants, cinema, m. M. It is also easy to make day trips from here with ferries to Grinda, and Sandhamn or to Stockholm. To Stockholm, the boat takes 1 hour. It stays in the Old Town and at the Grand Hotel near museums and parks. By bus you can reach about 40 minutes. For families with children there are several playgrounds in the area and mini golf course. You also eat the best ice cream in Vaxholm. Centrally located in smaller town by the water. Close to Stockholm. In the middle of Stockholm archipelago. Perfect home base for a week’s stay in the Stockholm area! This house was perfect for my family of 6 (4 children). Before our arrival, we were slightly worried that this house would be too far from Stockholm. We were wrong... not only is Stockholm very accessible by car, bus, and ferry, but this house allowed us to experience the unexpected pleasures of the Archipelago, including Grinda Island and Vaxholm. The area is so relaxing and peaceful. The house itself is very comfortable with plenty of space, large/comfortable beds, laundry, and modern bathrooms. The property is perfectly located on Vaxholm just steps away from great restaurants, ice cream, grocery, and public transportation (you can watch the ferries come and go from the front porch). 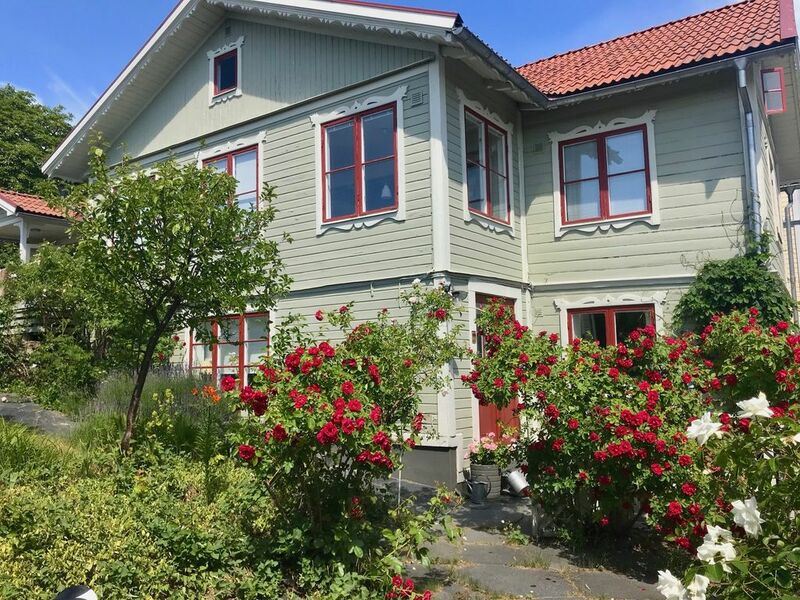 I would recommend this property for anyone vacationing in the Stockholm area with their families and prefers the comforts of home rather than an impersonal hotel. Kaptensgatan 3 has water views and is Vaxholm most central villa. 30 meters from the town center with bakeries, restaurants, cafes, small shops, supermarket, pharmacy, liquor, m. M. Moreover, only 50 meters to the ferries that take you out to the outer islands, or to Stockholm. There are also buses with heavy traffic to Stockholm daily. The villa has a large plot with several patios. Fully protected from view. For those who want to take a bath, it only takes a few minutes to go to North Port's beach located in Vaxholm cozy home-farm, which offers food, lovely pastries and drinks throughout the summer. Several cozy beaches and swimming are close to Vaxholm. The easiest way to get around on bicycles or pedestrians. Two bicycles are available for tenants.